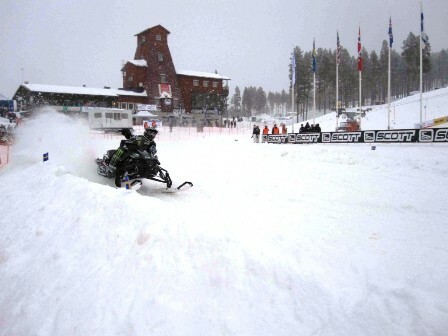 MALA (SWEDEN) – American rider Tucker Hibbert is the FIM Snowcross World Champion 2010. The 25 year old rider from Minnesota won two of three races, Swedish rider Johan Lidman is the Vice-World Champion, Cory Davis from Alaska finished third. This is the great success of the Arctic Cat manufacture. The event has started on Friday with the opening press conference. There was a big interest for American riders and Swedish National Champion Johan Lidman of course. Already a day before the main day many spectators and journalists attended the event. Riders tried the track for the first time. In Mala there was snowing both days, what made the racing conditions more difficult. But the organizer made a good job on the track. Despite the fact it was snowing all the time, about 10.000 spectators came to see the best snowcross riders in the World on the racing day. The track was ruff, it was getting more difficult in every race. All of three races were very exciting. In the first race Finnish rider Jussi Honka took the lead in front of Cory Davis. Tucker Hibbert did not have very successful start and he attacked from the back. Also home favorite Emil Ohman was not in front. But they were both riding very fast and risky. Hibbert won and Ohman was second. Swedish rider Viktor Stenman, who was also one of the home favorites for the podium did not finish the first race and already at the beginning he lost chances to finish on the podium. Before the second race Snowcross World Champion 2008 Emil Ohman had still a chance to fight for the new Title. His dreams disappeared in the third lap, when a crash put him out the race. Tucker Hibbert and Johan Lidman were fighting for the win. Lidman surprised Hibbert in the middle of the race when he overtook the American. Hibbert attacked back and Lidman could not resist. It was the second win for Hibbert, who was very close to take the Title. In the last race Emil Ohman decided to make the complete attack to take at least the win, if he was already out of fight for the Title. Hibber took the holeshot but this time was not easy to stay on the top. Ohman passed him and was riding too fast for everyone. Would have been great to see. Congrats to Tucker and Cory. Does Tucker get to go the the FIM Awards Banquet? Probably an ISOC race on 12/5/10. I'd like to see Tucker in a Tux, with "The Shirt"! Pretty formal affair, I don't think you can do it in a Monster polo shirt! I was there and a I was very impressed about Tucker riding. He made it look so simple. Congrats Tucker from a very snowy Sweden! Hats off for the Monster team. 1-2-3 for Arctic Cat didnt hurt either. Me and my buddies even got to chat with the super nice Kirk Hibbert after the finals. Great news! What does FIM stand for??? I actually inlaitliy thought that Obama's plan to reduce the deficit by $4 trillion was not half bad. Thanks, Sen. Paul, for pointing out how tricky his words really are. I almost missed that.In the words of Sen. Paul (and it's silly that someone actually has to say this), If we're spending more this year than last year, that's not a cut.